Defense Minister will start reviewing replacment for Chief of Sraff Gadi Eizenkot. Nominees are Aviv Kochavi, Yair Golan, and Nitzan Alon. Defense Minister Avigdor Liberman announced that he will start the process of picking a replacement for Chief of Staff Gadi Eizenkot when he steps down in December 2018. 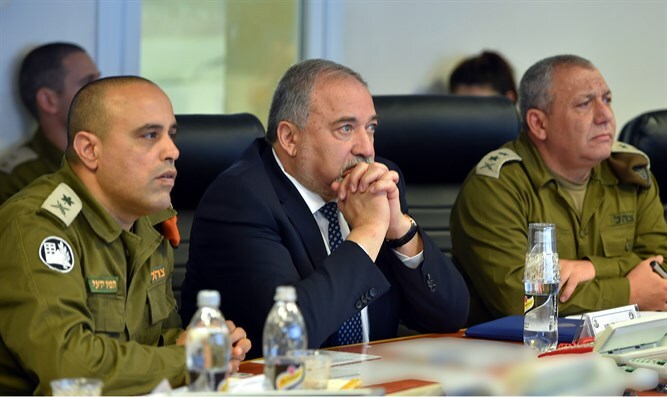 "In the coming days, I will begin the process of selecting the next chief of staff," tweeted Liberman. "The process will be orderly and responsible, as the IDF continues to face increasing threats on several fronts close and far. I will choose the best chief of staff who will know how to lead the IDF to victory on the battlefield. " Eizenkot has headed the IDF since replacing Benny Gantz in 2015. The Chief of Staff serves a three-year term and is traditionally appointed to the fourth year. Despite speculation that Netanyahu sought to extend Eizenkot's term by a year, the Chief of Staff shot down rumors in June and insisted he will retire in December. The selection process is based on recommendations by the Military Advocate General's opinion and consists of six stages. The first two will engage in consultations with Chief of Staff Gadi Eizenkot and with former senior officials, including prime ministers, defense ministers, chiefs of staff and senior commanders in the past. The Defense Minister will then interview the candidates for the position to be approved by the Senior Appointments Advisory Committee to ensure that all of them meet the committee's requirements and are qualified to serve as chief of staff. Lieberman will formulate his position vis-a-vis the leading candidate, in consultation with the prime minister, and then bring the necessary appointment to the cabinet for approval. The three nominees to replace Eizenkot are Aviv Kochavi, Yair Golan, and Nitzan Alon. Of the three, Kochavi is considered the clear favorite. The current Deputy Chief of Staff, Kochavi has a long record of battlefield success and is considered a courageous and efficient leader. Major General Yair Golan was once considered Eizenkot's likely successor. However, his image was tarnished after he sparked controversy when he seemingly compared Israel to Nazi Germany in a speech on Holocaust Memorial Day in 2016. If there is something that frightens me about the memory of the Holocaust," Golan had said, "it is seeing the abhorrent processes that took place in Europe, and Germany in particular, some 70, 80 or 90 years ago, and finding manifestations of these processes here among us in 2016."